Fine motor activities for toddlers don’t need to be expensive. For this simple activity we used an old Pringles container (any type of container with a lid will do), cut a hole in the lid and gave the kids some pom poms. Make the hole slightly smaller than the largest pom pom so that a bit of work is required to get them in. If your toddler is quite young, make sure you supervise them so that they don’t eat the pom poms! It sounds so simple but this activity kept my two girls busy for at least half an hour today. You can decorate the containers if you want to, but it’s not necessary. Lovely idea! Those little pom poms have such a lovely feel about them I can’t blame your girls for being entertained for so long! Pom poms are always a sign of fun. My daughters would love this. 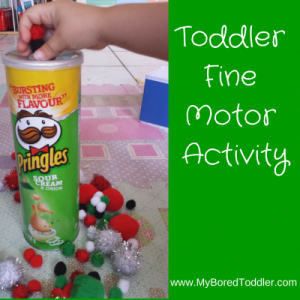 Lovely and simple fine motor ‘game’ T would have loved this when he was little. What a great idea. My toddler loves pom poms, I will need to try this with him.